樊宗山, 敬广伟, 赵海鹏. 游泳运动对APP/PS1转基因小鼠学习记忆能力的影响[J]. 四川动物, 2017, 36(6): 663-668. FAN Zongshan, JING Guangwei, ZHAO Haipeng. Effects of Swimming Exercise on Learning and Memory Ability of APP/PS1 Transgenic Mice[J]. Sichuan Journal of Zoology, 2017, 36(6): 663-668. *通信作者 Corresponding author, 赵海鹏, 男, 博士, 副教授, 研究方向:动物学, E-mail:hpzhao1980@qq.com. Abstract: To investigate the effects of swimming on learning and memory ability of APP/PS1 transgenic mice. 11-month-old male APP/PS1 transgenic mice were randomly divided into control group and swimming group. The control group had no exercise, and the swimming group had swimming training for 1 month. The expression of Aβ plaques, neuron apoptosis, mitochondria biogenesis-related protein expression and the learning and memory of APP/PS1 transgenic mice were determined by Congo red staining, Tunel assay, Western Blot and Morris water maze. The result showed that swimming exercise reduced the formation of Aβ plaques and neuronal apoptosis, promoted mitochondria biogenesis in the cerebral cortex of APP/PS1 transgenic mice, and enhanced the ability of learning and memory of APP/PS1 transgenic mice. This study suggested that swimming can promote the learning and memory ability of APP/PS1 transgenic mice by facilitating mitochondria biogenesis, and thus can be used as a treatment for the prevention and treatment of Alzheimer's disease. 图 1 PCR鉴定APP/PS1转基因小鼠 Fig. 1 APP/PS1 transgenic mice identified by PCR M. Marker, 1.APP/PS1转基因小鼠APP/PS1 transgenic mouse，2.野生型小鼠wild type mouse. 图 2 游泳运动对Aβ斑的影响 Fig. 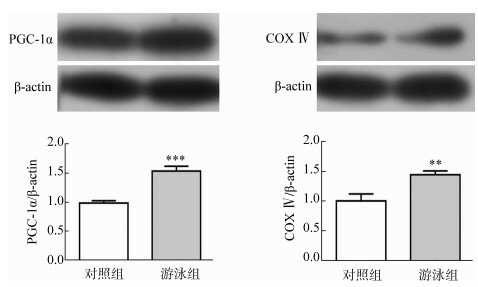 2 Effects of swimming on Aβ plaques A.刚果红标记的Aβ斑，B. Aβ斑的统计分析；**P＜0.01。	Aβ plaques marked by Congo red staining, B. statistical analysis of Aβ plaques; **P < 0.01. 图 3 游泳运动对皮层神经元的影响 Fig. 3 Effects of swimming on cortical neurons A. Tunel标记的凋亡细胞，B.凋亡细胞的统计分析；**P＜0.01；DAPI.染细胞核，Tunel.断裂的DNA，Merge.凋亡细胞。	A. apoptotic cells identified by Tunel, B. statistical analysis of apoptotic cells; **P < 0.01; DAPI. nucleus, Tunel. broken DNA, Merge. apoptotic cells. 图 4 游泳运动对神经元PGC-1α和COX Ⅳ表达的影响 Fig. 4 Effects of swimming on the expression of PGC-1α and COX Ⅳ in neurons **P < 0.01, ***P < 0.001. 图 5 游泳运动对APP/PS1转基因小鼠学习记忆能力的影响 Fig. 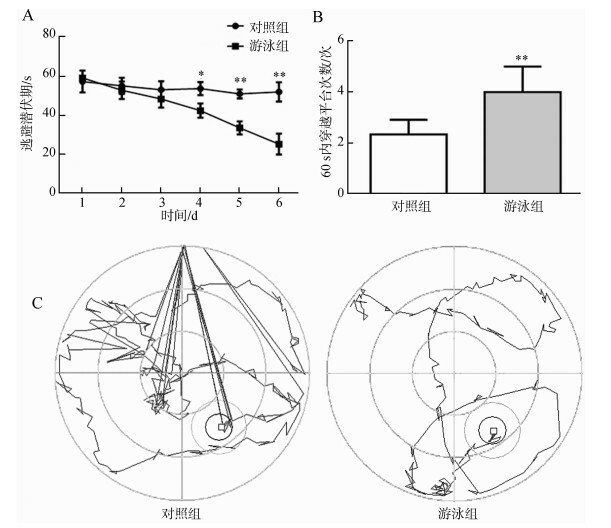 5 Effects of swimming on learning and memory abilities in APP/PS1 transgenic mice A.逃避潜伏期，B.穿过平台的次数，C.游泳轨迹；*P＜0.05，**P＜0.01。	A. time of latency, B. passing times across the platform quadrant, C. swim-tracking path; *P < 0.05, **P < 0.01. 崔建梅, 李小利, 付芳, 等. 2013. 游泳运动对衰老大鼠学习记忆、前额叶皮质氨基酸水平及nNOS表达的影响[J]. 吉林大学学报(医学版), 39(4): 737–742. 刘艳萍, 陆征宇, 董强. 2015. 阿尔茨海默病病理改变的线粒体机制[J]. 神经损伤与功能重建, 10(3): 239–241. 栾海云, 李娜, 王桂华, 等. 2016. 游泳运动对D-半乳糖致衰老小鼠学习记忆和胆碱能神经系统功能的影响[J]. 中国运动医学杂志, 35(1): 36–39. 王来, 祝世功. 2016. 线粒体生成与脑缺血再灌注损伤的研究进展[J]. 中国病理生理杂志, 32(8): 1478–1483. Abrahan C, Ash JD. 2016. The potential use of PGC-1α and PGC-1β to protect the retina by stimulating mitochondrial repair[J]. Advances in Experimental Medicine & Biology, 854: 403–409. Marcelino TB, Longoni A, Kudo KY, et al. 2013. Evidences that maternal swimming exercise improves antioxidant defenses and induces mitochondrial biogenesis in the brain of young Wistar rats[J]. Neuroscience, 246(5): 28–39. Picone P, Nuzzo D, Caruana L, et al. 2014. Mitochondrial dysfunction:different routes to Alzheimer's disease therapy[J]. Oxidative Medicine & Cellular Longevity, 2014(2): 780179. Wang L, Chen M, Yuan L, et al. 2014. 14, 15-EET promotes mitochondrial biogenesis and protects cortical neurons against oxygen/glucose deprivation-induced apoptosis[J]. Biochemical & Biophysical Research Communications, 450(1): 604–609.